After an initial fitness assessment we will work together to reach your fitness goals, whether it's a 5K walk/run, marathon, weight loss, or just to get back in shape. After our workout sessions you will feel strong, motivated, and energized to tackle your day. Remember exercise is one of the main components to a healthy mind and body. I will motivate you to reach your goals no matter how small or big. We will work together customizing your individual needs towards achieving your goals. I know how it is to start slowly and work your way up. 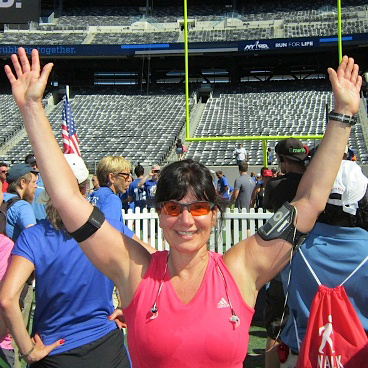 I became a personal trainer after successfully completing 3 marathons, 3 sprint triathlons and 2 bike centurions. I started my training slowly by walking on the treadmill 2 miles and then gradually changed to running. I progressively increased my pace and distance and completed my first marathon 2008. After completing my first marathon I decided to try another challenge and joined a triathlon club. The only problem was I could only swim doggy paddle. Of course I was the worst one in the group. However I didn't give up and completed my first triathlon in 2010. With each goal accomplished you will gain more confidence and be the strong successful person that you were meant to be. ANYTHING IS POSSIBLE!